If your snake isn’t in the mood to eat and turns up his nose at a hopper, you can’t just let them hang out together until the snake changes his mind. To avoid the possibility of injury to your pet, you’re going to have to give the rodent his own room and feed him -- at least until the next go around. Get thee hence to the nearest pet supply retailer and stock up on balanced formula lab blocks, which provide all the nutrition that mice need. Juvenile feeder mice are categorized according to age, length and weight. Hopper mice are two to three weeks old, 1 1/2 to 2 inches long excluding the tail, weigh 7 to 12.99 grams, have fur and fully opened eyes, and are the same size as rat fuzzies. Because their mama begins weaning baby mice between two and three weeks of age, your hopper has already begun eating solid food. Feeder mouse breeders start hoppers on lab or rat blocks when weaning begins, so your little guy has already test driven them. Pinkie mice are one to five days old, are about 1/2 to 1 inch long and weigh about 1/2 to 3 grams. Fuzzies are six to 13 days old, about 1 to 1 1/2 inches long and weigh 3 to 6 grams. 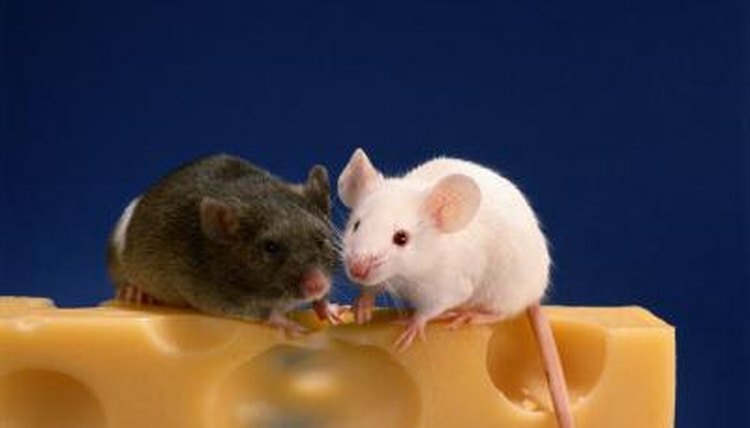 Weaned mice are three to four weeks old, 2 to 2-1/2 inches long and weigh 13 to 18 grams. 2nd Chance: A Mouse in the House or Two Mice Are Nice -- What Should I Feed My Pet Mouse?